On November 20, 2014, President Obama issued an executive order that formally protected 5.5 million undocumented citizens from deportation. Instead, it gave them 3 years to "make a path" for themselves, either toward citizenship, or towards the workforce. Obama has said that once of the most "frustrating parts of [his] presidency" has been the lack of progress made in the areas of immigration. Current estimates say that there are an estimated 12 million people, living in the United States without proper citizenship or documentation papers, and there are a variety of problems, additionally, with the legal citizenship process. So, what should we do? 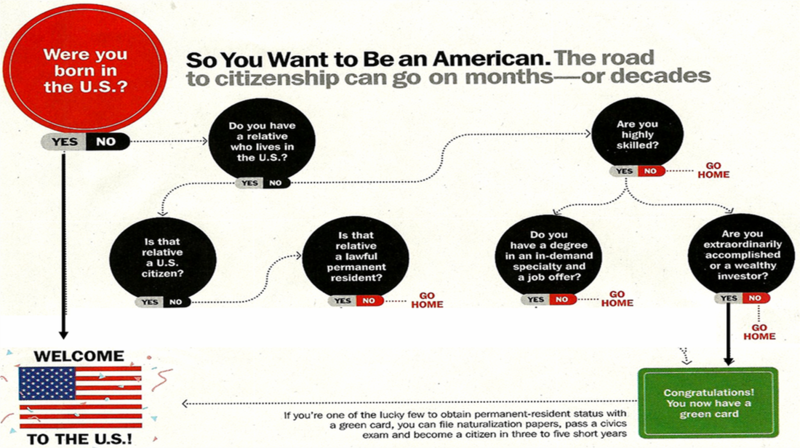 We firstly have to start with the citizenship process: the "status quo" (current state) of becoming a citizen. Part I: The "Status Quo"
Let's start with the basics. What is the state of immigration in this country? 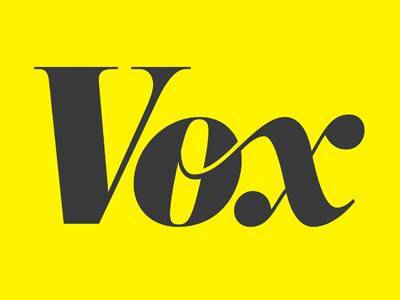 VOX.com has a great "card stock" on the topic. Click on the image to the right to access their site. Basics of the U.S. Immigration System. 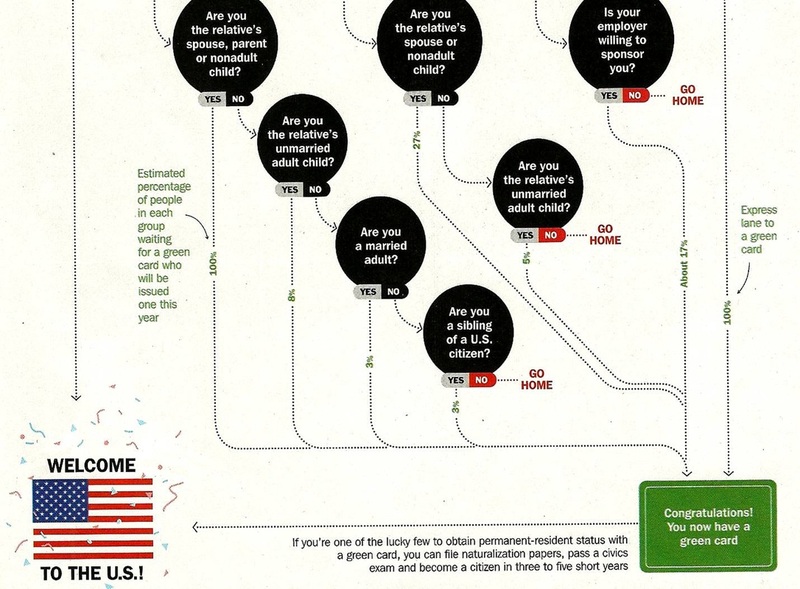 TIME Magazine provides a great graphic for the current system, the status quo, of immigration and naturalization. Examine the graphic below, and click on it to make it bigger! CONSIDER this QUESTION: From purely a "family connection", what's your greatest percentage odds of getting into the United States? Now, let's look at a graphic from the New York Times regarding proposed solutions to the problem. Then answer the questions below. Regardless, unless things change, all of this is simple rhetoric: strong and emotional words that can convince people of "greatness", but in the end, might not deliver on the promises. And again, if we refer back to the issues of deportation, then it seems like Obama's immigration "legacy" is tarnished. In June 2012, TIME Magazine published an editorial on the state of immigration and immigration reform in today's American society. The article, titled "Not Legal, Not Leaving", exposes the fact that over 12 million undocumented citizens reside in the United States, and though they're "not legal" (don't have the required citizenship papers), they don't plan on leaving anytime soon. Quite frankly, the system, and not these people, is broken. But how? Why? And what can we do? Utilizing some of the text from TIME's article, let's explore some infographics and animations to get to the root of the problem. That's usually the first thing people ask me when they learn I'm an undocumented immigrant or, put more rudely, an "illegal." Some ask it with anger or frustration, others with genuine bafflement.... It's a fair question, and it's been hanging over me every day for the past year, ever since I publicly revealed my undocumented status....Like many others, I kept my status a secret, passing myself off as a U.S. citizen — right down to cultivating a homegrown accent. I went to college and became a journalist, earning a staff job at the Washington Post. But the deception weighed on me. When I eventually decided to admit the truth, I chose to come out publicly — very publicly — in the form of an essay for the New York Times last June . 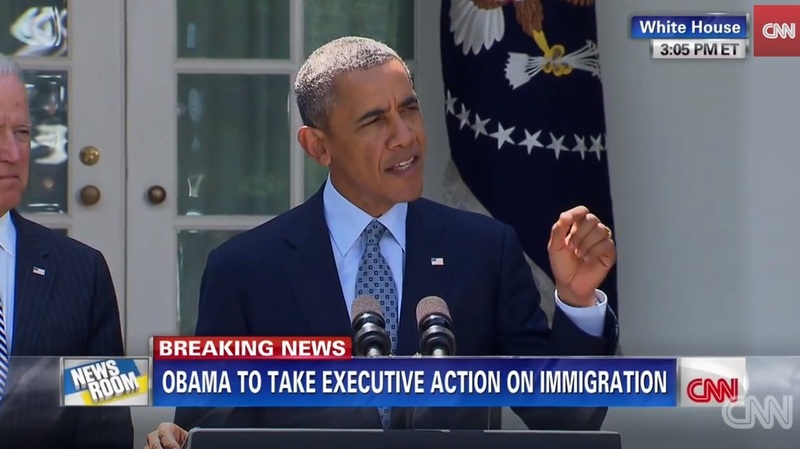 The contradictions of our immigration debate are inescapable. Polls show substantial support for creating a path to citizenship for some undocumenteds — yet 52% of Americans support allowing police to stop and question anyone they suspect of being "illegal." Democrats are viewed as being more welcoming to immigrants, but the Obama Administration has sharply ramped up deportations. The probusiness GOP waves a KEEP OUT flag at the Mexican border and a HELP WANTED sign 100 yards in, since so many industries depend on cheap labor. One man asked me this once. And I told him: "I haven't become legal, because there's no way for me to become legal, sir." Another lady jumped in. "You can't get a green card?" "No, ma'am," I said. "There's no process for me." The long-stalled Dream Act is the best hope for many young people. The original 2001 version would have created a path to legal status — effectively a green card — for undocumented people age 21 and under who had graduated from high school and resided in the U.S. for five years. I addressed this question at a "civility round table" discussion awhile back. Everyday life for an undocumented American means a constant search for loopholes and back doors. Take air travel, for instance. Everyone knows that in the post-9/11 era, you can't fly without a government-issued ID. The easiest option for most people is their driver's license. Most states will not issue a license without proof of legal residency or citizenship. But a few grant licenses to undocumented immigrants, New Mexico and Washington State among them. Like many others, I had falsely posed as a Washington State resident in order to get a license. Undocumented workers pay taxes. I've paid income taxes, state and federal, since I started working at 18. The IRS doesn't care if I'm here legally; it cares about its money. Some undocumented people, of course, circumvent the system, just like some citizens. But according to the nonpartisan Institute on Taxation and Economic Policy, households headed by undocumented workers collectively paid $11.2 billion in state and local taxes in 2010 — $1.2 billion in income taxes, $1.6 billion in property taxes (because undocumented immigrants do own property) and $8.4 billion in consumption taxes. 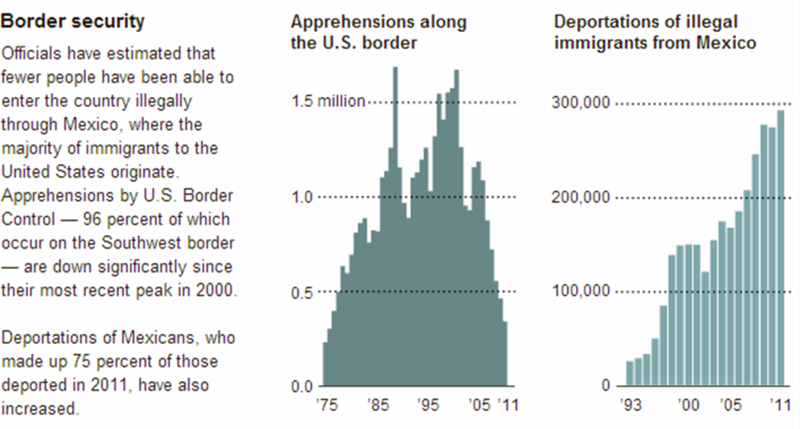 Though roughly 59% of the estimated 11.5 million undocumented immigrants in the U.S. are from Mexico, the rest are not. About 1 million come from Asia and the Pacific Islands, about 800,000 from South America and about 300,000 from Europe. Others come from Nigeria, Israel, pretty much everywhere. In the case of countries that don't share a border with the U.S., these are almost always people who entered the country legally — as vacationers or on temporary visas — and overstayed the time permitted. I am still here. Still in limbo. So are nearly 12 million others like me — enough to populate Ohio. We are working with you, going to school with you, paying taxes with you, worrying about our bills with you. What exactly do you want to do with us? More important, when will you realize that we are one of you? 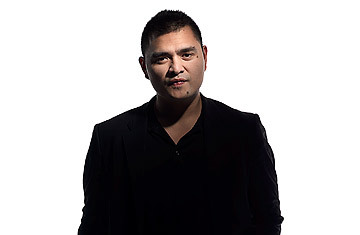 What's one thing you learned from Mr. Vargas' interview that surprised you? What did you learn about the "green card system"?